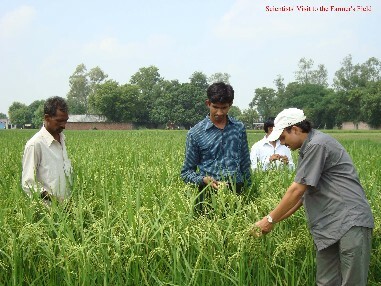 Initially about 400 acres of existing land available for cultivation has been used for cultivation of food grains and Plantation crops, involving scientists of KVK, coordinated projects and campus farm staff with financial support of the university and ICAR. About 100 ha have been planted under food, oilseed and forage crops during 2005. Another 500 ha, has been made ready, for cultivation and planting by the start of 2006. Conduct of Front Line Demonstrations by in-charges of relevant projects (Dry Land, MULLa RP, Pigeonpea, Maize, NSP, Cropping System) in 1 ha land each is being undertaken from this Kharif Season. Biological fencing for the area of about 4 km by trenching and seeding Jungle Jalebi and Leuciana/Bamboo is being done at the site to protect it from stray animals and other intruders. The Nursery for horticultural plants/trees like Bel, Anola, citrus etc. is being developed. 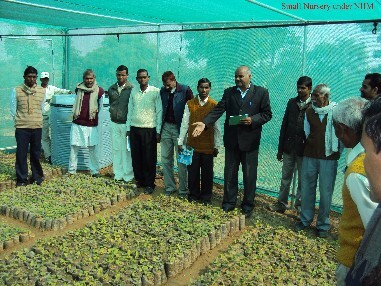 The funds for cultivation of these can be procured through projects submitted under Horticulture Mission of Govt of India. Plantation of Bamboo/ Chiraunzi/ Katha, Bel, Aonla etc. would be taken up on priority basis, as these are native of this area and have high economic value. Bio diesel is another area of interest for development. Various companies and Govt. agencies towards such developmental studies are putting lot of efforts. About 200 ha area would be used exclusively for Jatropha cultivation. A project funding of Rs 1.0 Crores has been sanctioned by the Ministry of Agriculture, Govt. of India.